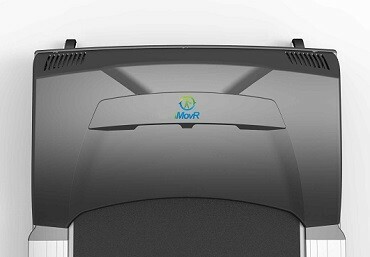 iMovR's ThermoTread GT is the first treadmill desk base designed from the ground up for walking while working at a computer. 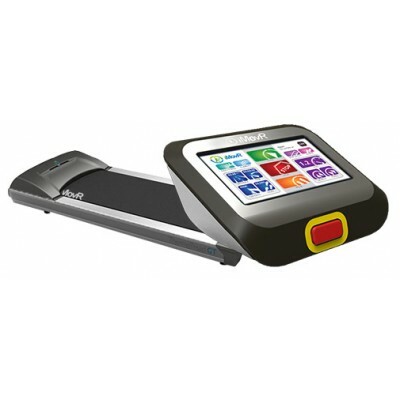 Upgraded componentry, modern touchscreen LCD desktop controller, and future ability to interact with corporate wellness software as well as personal performance tracking in the cloud (via optional CloudStation available 2018), the ThermoTread GT is the high end of the office treadmill market. 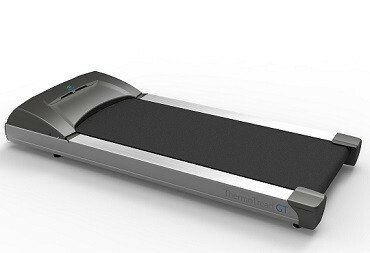 Read WorkWhileWalking's review of the ThermoTread GT Office Treadmill. Walking at a pace of only 1-2 mph for long periods of time on a treadmill designed for running often results in premature motor or controller board burnout. It's because the treadmill’s motor has to overcome the immense friction of pulling dead weight on a rubber belt across a laminated deck. A treadmill that was designed for a top speed of 12 mph will only have 1/6th to 1/12th of its rated horsepower at walking speeds, which is a very heavy strain on the drivetrain. What also shortens the life of these components even further is not lubricating your treadmill regularly. In the ThermoTread the top speed is capped at 2.5 mph, and its high-torque drivetrain with a 3.0 horsepower, 4000 RPM DC motor is perfect for office walking speeds. The ThermoTread GT features a superior 1”-thick Bakelite material instead of cheaper melamine or phenolic. Motor temperatures are controlled with a cooling fan even if the treadmill is working round-the-clock. Also thanks to being silent you won't even notice it's on. The GT unit is shorter than most treadmills designed for running since walking gait is that much shorter. The lowered deck maximizes desk stability and minimizes obstruction. Thanks to the two wheels underneath the motor housing the treadmill is easy to slide underneath any desk. Say goodbye to unattractive membrane keypads with this colorful touchscreen controller. The ThermoTread GT is the only treadmill desk base that uses a touchscreen LCD, which doesn’t stand out among laptops, tablets and mobile devices you can find on a modern office desk. Equipped with a powerful computer and a USB port (to enable easy downloads of future software upgrades), the console displays your walking speed, time, distance, calorie burn, and other performance statistics. Need to restart your treadmill after stepping away for a few minutes? With ThermoTread’s user-friendly console interface you can navigate it faster while it also interprets, stores, and retrieves user preferences and usage info easily. If you're concerned for potential employer liability the ThermoTread GT offers precautions against that as well. The treadmill is UL-certified to never exceed 2.5 mph, which is below the speeds at which treadmill injuries typically happens due to mishap or cardio exhaustion. No injury claim has ever been reported at this speed limit! Designed specifically for large enterprise organizations and public space usage, the ThermoTread GT console requires users to click off on a liability waiver “click wrap,” just like when using the car GPS navigation system before activating it. This exclusive feature protects your organization from potential liability and unsafe operation, all while creating a record of all equipment usage. iMovR's optional CloudStation is an upcoming feature on the Thermotread GT. 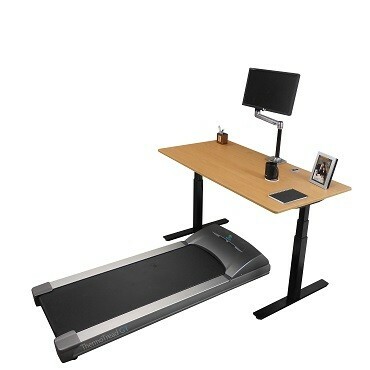 Conceived as a long power bar to be installed underneath the desk, the cloudstation will have the ability to connect to your treadmill, electric adjustable desk, and other electrical devices on your desktop. Software controlled power plugs allow for setting single-touch power conservation modes, turning everything off (for when you leave the office) or keeping a laptop charger on. 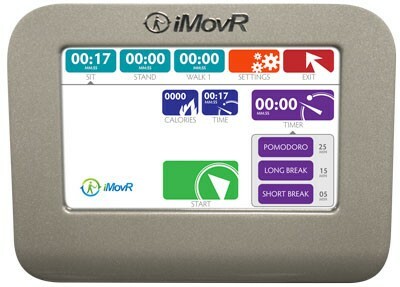 The plug for the treadmill is special thanks to the iMovR's proprietary circuitry that works like a cardiogram, which precisely measures the health of the treadmill and the usage profile of the user by interpreting current fluctuations generated by the user’s feet on the belt. 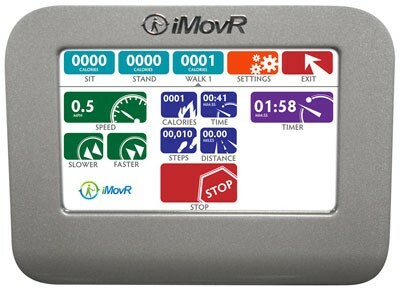 It can also measure distance, speed and step count with extreme precision and upload it to the iMovR cloud. The popular fitness sensors (e.g. FitBit and Nike FuelBand) significantly underreport treadmill desk usage while other treadmills have unstable Bluetooth connections to laptop software. iMovR CloudStation won't skip a single step while each session data syncs automatically, without requiring you to remember or risk losing it. Once data is in the cloud, it can be shared with corporate wellness software platforms, personal fitness sensor software, and a variety of iMovR enterprise applications. While the CloudStation is optional, it can help you extend the life of your equipment and reduce your power bills, by measuring friction levels in the treadmill and notifying you when it’s time to lubricate. Once a user sets up their profile in the iMovR cloud (defining your preferred treadmill speeds, desk height and monitor height), you’ll be able to log into any iMovR treadmill desk, anywhere in the world, and immediately get to work at an ideal ergonomic position with your every step automatically recorded to the online profile. 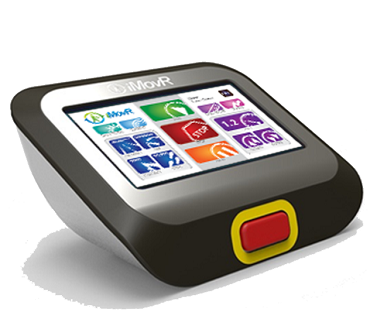 A standalone ThermoTread GT is limited to 5 user profiles, and a CloudStation connection allows for an infinite number of users. iMovR offers an excellent warranty on the ThermoTread GT, reflecting their confidence in the office treadmill's manufacturing quality. 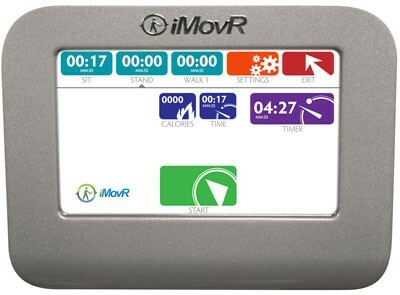 See iMovR's official Warranty page for more details. We honor the manufacturer's 100-day, 100% Satisfaction Guarantee. If you receive your ThermoTread GT product and decide it is not what you are looking for, or would like to exchange it, please send it back and we will give you a full refund minus a 20% restocking fee. Customer is responsible for shipping and handling costs of the return. The product must be in its original packaging, and in sellable condition. Simply email us at customerservice@sitless.com or call (888) 959-0025 for a return merchandise authorization number. Please note that shipping and handling costs are nonrefundable. The standard shipping cost for ThermoTread GT units is $149. This flat rate applies to any major metropolitan region within the continental United States except New York City. ThermoTread GT Office Treadmills shipped via freight carrier. You'll receive a tracking number by email once the product has been loaded onto the delivery truck. All treadmills are shipped out within 5 to 7 business days from date of order. Delivery to any major metro area within the continental US takes 3 to 5 business days from when it leaves our factory. More remote areas can take an additional 1 to 4 days. These delivery times are based on ideal weather conditions and the dispatcher's ability to reach the customer by phone to schedule delivery. Please allow for extra time if there is inclement weather anywhere between Michigan and your area. The vast majority of deliveries are made within 8 to 14 business days of ordering (not including weekends and holidays), depending on distance from Michigan. Southeast and Southwest US deliveries can take longer. A dispatcher will call you 24 hours in advance to confirm the address and a convenient 4-hour window for delivery. Delivery times are available from 7am to 7pm in most markets. Standard delivery is to the first covered threshold. In apartment buildings and office buildings this would be to the lobby, if there is a doorman or receptionist. If there is no covered area to place the delivery in, it will be taken as close as possible to the building structure, which may be curbside, and it will be the customer's responsibility to unload the pallet and bring merchandise into the building. For inside delivery, select Room of Choice or Premium Delivery (see below). Note that Premium Delivery includes Room of Choice. Premium Delivery always includes factory pre-assembly and testing. Some smaller desk systems may be shipped by FedEx Ground. Manufacturing and delivery times will be similar to freight shipments described above. NYC deliveries, non-standard delivery times, and other special delivery options requested by the recipient, as well as delivery to addresses that are more than 50 miles away from our freight carriers' designated hubs may be subject to additional delivery surcharges. 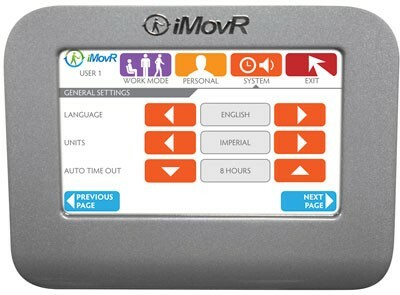 Provide iMovR with the best phone number for the delivery dispatcher to reach you, or someone in your receiving department (they will typically call within 24 hours of the shipment reaching your local area). You can send this information by email to customercare@imovr.com referencing your name and order number, and we will make sure the information is relayed to the carrier doing the delivery. We can ship to any freight forwarder in the continental US for the same flat rate as to any other domestic customer. It would be your responsibility to select a freight forwarder, set up an account, and negotiate freight forwarding rates. If you go with this option, contact iMovR at customercare@imovr.com or (425) 999-3550 with your order details and the delivery address for your freight forwarder, and we will get back to you with pallet dimensions, weights, and any other information required for your forwarder to generate a quote for you. For international customers, the product can be shipped directly to you via DHL Global Freight (ocean) or DHL Express (typically 2-day or 3-day air). Please contact us with complete order details, full shipping address, and contact information so that we may generate a quote for you. By default, we will generate a quote for DHL Global Freight (ocean/ground) shipping only — unless you indicate you would like DHL Express (air) or both rates to compare. Please allow 24-72 hours to turn around an international delivery quote.